Discontinuing (from Wiktionary) – To stop producing, making, or supplying something. Once upon a time, my favorite boy toy had a thriving orchid business. He was very good at it and he loved it – growing them, taking care of them, selling them to customers. Unfortunately, the bottom fell out of the market. Energy costs went up, the importers drove prices down and made the plants disposable, and many orchid growers went out of business or bankrupt. My husband was heartbroken at discontinuing the business, but it also made things easier when we wanted to travel. He went back to his art and photography, which he enjoyed more. It’s hard to believe though that we had this going in our garage for so long. 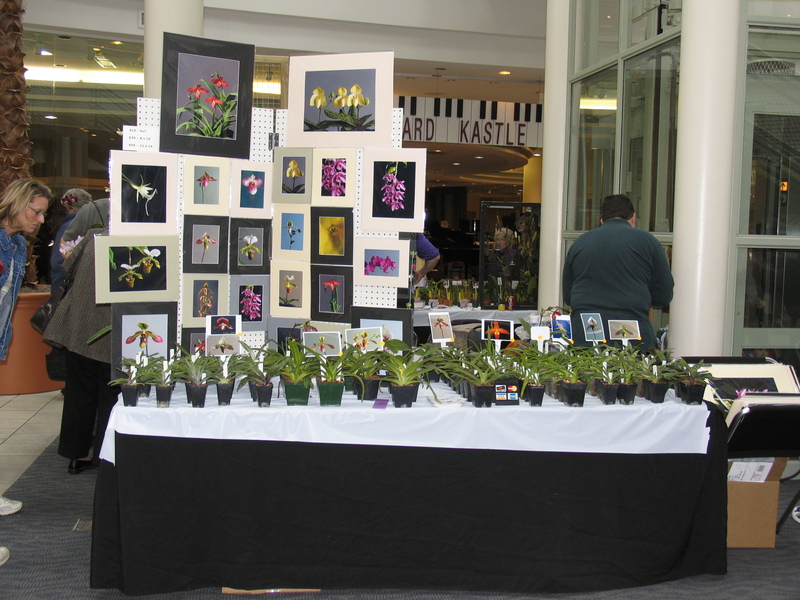 Here he is at a local orchid show, displaying his plants and photos. That’s him with his back to the camera. Word for tomorrow – INVITE. If you prefer to work ahead, see the list for the week under “A Word A Day”. wow…I love orchids. Just wish I could figure out how to get them to rebloom. They actually are not that tricky – my daughter does it in her kitchen windows which is hardly optimal. I think the trick is to keep them sprayed with water, but not to overly water the roots. Having grown up in Hawaii you’d think I’d have a green thumb for growing orchids. No such luck. So I’m in awe of your hubby’s having had a business around the delicate flowers. He’s indeed talented if he not only grew them, but had them proliferate. He is talented in so many ways – thanks for the compliment!